From the Introducing Goal Setting article, a variety of medium term goals (MTGs) and long term goals (LTGs) should be set. As longer term goals drive our intentions, Short Term Goals (STGs) can now be set. To set STGs, ask at least another reliable source. In my experience, purely working from self- evaluation can lead to individuals either being too critical or too nice about themselves. This would lead to setting goals that are unrealistic. To get a good balance, it is always best to work from at least two sources of information: coaches, other climbers, observation, self-evaluative methods, psychometric tests etc. One of these sources should be from the individual themselves as it is important that the athlete has an input into the goal setting process at this stage. The other should be from a reliable source that would not be biased or `too nice` to critique one`s performance. The weaknesses identified in one`s climbing should match up with at least one reliable other. For example, I asked other climbers that I normally climb with, what they thought I needed improved upon in my climbing and the feedback I got were in line with my personal goals. Power endurance was named as one of my weaknesses. A specific example of this was my recent attempt at a grade 7a at The Climbing Academy (TCA). This problem was very crimpy and each move was just as powerful as the last. I could do the start of the problem fine and also the end of the problem, but I couldn`t link the two together. I found as I worked my way through the problem, I got too pumped (for non climbers, this means fatigued) and I would drop down. I lacked the ability to carry out a sequence of moves at my near-maximal ability. Another area of climbing I wanted to attack was my endurance. This was evident in my climbing when I went indoor leading (pulling the rope from behind and clipping in) with my friend at Edinburgh International Climbing Arena (EICA) a couple of weeks ago. It was the first leading session I had done in over a year so I was a bit unsure of the session considering the friend I was climbing with was somewhat of a regular to climbing routes. EICA have walls that can be 30 metres in height and I found that I lacked the endurance to climb even easier grades. I used to train at EICA and could do multiple routes in a day without feeling overly pumped. I attempted 4 routes and I was done. I realised how easy it was to lose any ability and it was imperative to not only introduce specific training but also to maintain training. Endurance affects my bouldering stamina as well. I find that I tire out after attempting a number of problems and I don`t necessary have `good` endurance compared to other climbers. When setting goals, there should be a number of recent examples that an individual can name which has caused concern or has become an issue. Part of my role as a Performance Consultant (specialising in sport psychology) will be to counsel the individual to speak about these issues. Often, some issues require further probing or insight in which I will guide further discussions in order to reveal the true source or speak of the source (which can be a sensitive topic). By addressing these issues, we are proactively doing something about the situation which will automatically instigate hope in the individual. I will then introduce interventions specifically geared towards these certain issue(s) which will further diminish any debilitating effects that the issue(s) had initially. As I mentioned before, it is important to focus on a variety of goals. For the purposes of training, it is important in the respect that not one aspect of your sport should be neglected. It is imperative to get to know your own body. Focus on a few goals to begin with and then slowly build up to a complete program eventually encompassing all the core abilities of the sport. The intensity can be adjusted depending on what the longer term goals are. For example, as my focus is on bouldering and trying to consolidate myself within the 7a grade, my priority will be power endurance with endurance following behind closely (hence, why routes are not one of my longer term goals). I will focus one intense session on power endurance and 3 light sessions on endurance. As I improve, I will add additional power endurance exercises into my plan and increase the climbing grade that I use for the exercise(s) to get that severe pump I am looking for. My core was another aspect of my climbing I wanted to work on but does not take priority over power endurance and endurance. Additionally, I want to add another two indoor 7a`s to my climbing repertoire. Therefore, when I am training I will aim to train for power endurance 60% of the time, 20% on endurance and 20% on core with projecting 7a`s in any additional climbing time. To set STGs, we are fortunate enough that there is a wealth of information already published in articles, journals, books and most can be accessed via the internet. Examples of training plans, ideas for specific exercises and being guided to the best training books out there today can be pulled. It is important to note, that whatever training program an individual goes with, it is tailored specifically to that individual`s needs, rather than adopting someone else`s training plan. Doing so will foster ownership into the program. As each goal is specifically set and adjusted for one`s weaknesses, it will instil a level of accountability. Having a wealth of information available to us is good in this respect. However, it also has its disadvantages. As there is so much information available on the internet, journals and books it can be difficult to decide where and what to start with. Multiple sources telling us that their methods are the best or one particular method works especially well for one type of athlete or another, it can get a bit confusing. Some individuals even give up at this stage. Too much choice can cause anxiety, frustration and laziness which will eventually lead to fall out (even before the program has started). This is where physical coaches can come in. Coaches can draw up a plan for you based on your physical weaknesses. As research can lead to a number of examples of plans, exercises, schedules, best practice is to write these down at the back of the goal setting book. This means that if one gets stuck with what to do for any training session, they would at least be prepared for what they could do by referring to these. Although, a variety of activities have been written down, it is important to try and stick to a few exercises to allow improvement gains to be seen. Doing so will increase motivation towards the program. This will also increase self-confidence due to witnessing personal gains over a period of time. STGs are written at the top of the page. These goals are set before a session and outline what needs to be done for the following session. I always advise to set these goals before as it will direct the training session ahead. Some of my clients set goals after the session which beats the purpose of setting goals. They are merely just reflecting upon their session. There is no baseline measure to compare their performance to. It is only after training sessions that reflection should occur. When reflection occurs, in as much detail as possible, state what was actually done in the session, along with any further comments and then an energy score rating out of ten. For example, I had set a STG of doing 4x4`s on slightly overhanging walls on strenuous problems. I only managed to successfully complete this on two of the problems. There is no doubt that I will need to alter the problems that I selected as I either totally pumped out or did not pump out too much. It also tells me that my power endurance is rubbish and definitely deserves the attention it is getting now. This information directs me to set my STGs for my next power endurance session. As I mentioned before, it is important that goals are not rigid and can be changed to suit the situation or to adjust to current performance levels. By having a list of exercises detailed at the back of the goal setting book, there is no `easy` escape route out of training. For example, I had set an endurance goal of `continuous climbing on easy boulder problems - aim for 40`. However, as the centre was busy at time of training I could not get on all the walls that I wanted to so rather than dismiss endurance training altogether, I changed this to `continuous climbing on the circuit loops` as the circuit routes were less busy. For some individuals, having a list of exercises is also effective as it will give the individual a sense of choice. As they are selecting what exercises they are doing, they are again increasing ownership into the program and limiting boredom (the main reasons why individuals fall out of the goal setting process). This will maintain motivation levels throughout the goal setting process. For my clients, I introduce an effective goal setting plan tailored towards areas of needed improvement but I will also help the individuals to maintain that plan. The process is about when to adjust goals or expectations and also, about being realistic with plans. There will be many stumbling blocks along the way. For example, frustration at the lack of improvement, failure for not having achieved STGs or even, a fear of failure which can hold an individual back from achieving further goals. I will address these issues and attack them within the goal setting process. As I progress through the first week (three training sessions in total), I follow the same procedure: note down my STGs before the training session and then almost immediately after the session, reflect upon what was actually done. 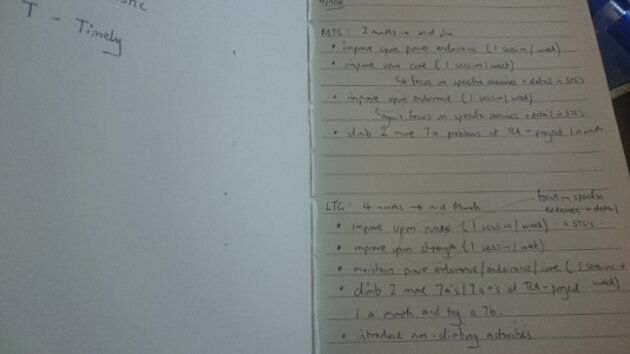 I also note down any additional exercises outside the STGs I have done which may come in handy for further sessions. For example, I have completed one of my MTGs (i.e. climb two more 7a problems at TCA) already which I had given myself two months to complete. This tells me that I will need to adjust my MTG and gear my STGs towards this. I obviously doubted my abilities of climbing consistently at the 7a grade. So at the end of the first week, goal setting should have allowed reflection upon previous sessions: what went right for the individual, what didn`t go so well for the individual, what exercises can guide further short term goals and also an indication of how tough a particular exercise was (as indicated by the scores out of ten for energy levels). As goal setting is self-evaluative, total honesty is required of the process. There is no point on lying as the only person that will be disappointed is the individual going through the process. One week into my enhancement program and I have learnt two important lessons: first, selecting what exercise to do or what exercise is more beneficial will have to be done through trial and error. I have found that most of my time this week was conducting the exercises that I had set myself and gauging, physiologically, whether they are way too difficult to me or way too easy for me. Take time to select what exercises are right for an individual. The start of the goal setting process may be challenging and may be inundated with negative thoughts i.e. 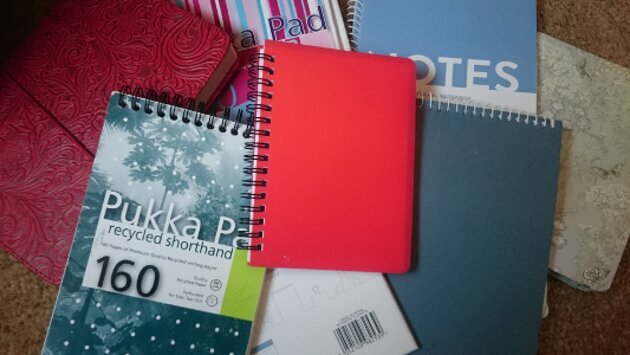 `what is the point?`, `too much writing involved, I can't be bothered!` or `how is this benefiting me as an athlete?`. The trick is to focus entirely on the STGs to begin with and before you know it, maintaining your goal setting book will become routine. Second, I have just realised how unstructured my previous training sessions were. Basically, I didn`t train for climbing before, I just climbed. Despite the fact that I would attempt to climb a particular problem a number of times, I didnt push or work hard enough to actually want that grade, or however many grades, higher. As with anything in sport, hard work is expected to achieve goals. Goal setting is no exception. A lot of time and effort is required to train for our sport physically but almost no time at all is invested for psychological training. Just as one would commit to a physical training program, the same dedication should be geared towards psychological programs. No one expects a tennis player to execute a one-handed topspin backhand cross court winner without lots of practice and commitment. This should be the same for any psychological process. It has only been one week but setting a goal setting plan has made me even more determined as an athlete. The process of achieving goals, adjusting, re-evaluating and reflecting upon training sessions has combined my determination, passion and energy towards a focus in my sport. I have no idea what sort of athlete I will be in two months, or in 6 months, but I am very excited to see what goal setting will bring me in the near future. Sport psychology is not the easiest subject to grasp. I have presented material in various forms in my workshops but I am constantly striving to better my previous attempts and improve on my effectiveness and efficiency. As I come to understand and know the worries and anxieties of athletes, I begin to realise that they are no different to mine. To show psychology in action, I have decided to document my own journey and analyse how I have learned to cope, or how I cope, when faced with certain experiences. I will implement core psychological strategies into my training structure which will be compiled together by taken key training ideas from various individuals and professionals. My reasons for doing so are threefold. First, I hope to demonstrate that psychology can be used to explain our actions and behaviours when faced with certain experiences. Second, I also hope to demonstrate that psychology can be used to help or alleviate certain 'unwanted' actions and behaviours when under stressful situations. And third, I hope to demonstrate that psychology can be implemented into a training structure easily. So to begin with, a little bit about me and my sport. I am a climber. Not a very good climber but still, I go through ups and downs as with any other athlete. I started climbing three years ago. I remember my first lesson at Edinburgh International Climbing Arena which introduced me to top roping (climbing with a rope attached to an anchor at the top of the wall which is attached to the climber via a harness). I was hooked from the very first day and began top roping regularly, say two to three times a week. I hated bouldering (climbing small(ish) heights with no rope or harness) and was a bit fearful, but in awe, of lead climbing (climbing with a rope and harness but climber needs to pull the rope from behind to clip in to the quick draws). However, as time and my upper body strength developed, I quickly moved onto leading. I signed up for a leading course at EICA and was shown all the basics on how to lead and belay. One of the exercises that I remember clearly was learning to fall. I was three quarters up a wall and I was told to fall at the next clip instead of clipping in. This was probably, one of many, heart stopping leading moments for me. I just could not let go of the wall. My instinct told me to hang on. I remember having to push myself out from the wall in order to force myself to let go. This was a mistake. The force that I generated whilst forcing myself away from the wall made me impact the wall much harder than I had expected and this resulted in a sprained ankle. This experience has stuck with me to this day since. I still argue that falling exercises (especially for the first time) should not have taken place on slabs (flat walls). My first unsupervised lead climb was all shaky legs and bent elbows (bent elbows tense muscles quicker and therefore, tire you out more). I soon tired out towards the top of my first grade 5 (in climbing terms, pretty easy) but I felt a satisfaction that I never had with top roping and I knew that from then on that top roping would not be the same anymore. I felt like a true climber. From that day onwards, top roping had lost its appeal. I worked on my leading skills throughout the months and quickly progressed to comfortably climbing at grade 6b, at times grade 6c (in climbing terms, still pretty easy but getting harder). Fear still gripped me at certain times and I never unintentionally fell. Bouldering came to me last. A relocation because of a boy (now my fiancé) and a job meant moving away from EICA and to Glasgow, where The Climbing Academy and Glasgow Climbing Centre reside. As I was TCA's youth squad's performance consultant, I decided that TCA would be my new climbing home. TCA is all bouldering and as I mentioned before I hated bouldering. My first days at TCA were lost on me – new walls, new people, new training regime etc. My motivation took a serious knock. My first attempts at bouldering, from the very few times I attempted this at EICA, saw me spat off a wall at font 5. I believed bouldering was just not for me. I did not understand or appreciate it. As my motivation took a knock this impacted on my confidence. I was used to doing routes than problems. However, I quickly realised that the upper body strength, core and endurance I had developed by doing routes transferred into my bouldering ability. Time passed, and my persistence and patience paid off. I could get on font 5s and not be spat off. My confidence took a bit of time to grow for me. I was not used to the social settings that bouldering walls had compared to leading/top roping walls. However, the more I bouldered, the more my technique on the wall developed. I realised that bouldering required a great deal of problem solving in order to get to the top. It takes a lot of skill and technique to keep your body into the wall whilst figuring how to move on the tiniest crimps. When I first started climbing, my satisfaction was to get to the highest wall in the centre whereas now, my satisfaction derives from how I get to the top of the wall. I finally understood bouldering. I love bouldering now. I started off bouldering font 5s and I have moved to climbing font 7a , sometimes 7b (in climbing terms, quite good). I boulder regularly, say three to four times a week and try to get outside as much as I can. I spend much of my climbing time bouldering and therefore, leading has taken a step back. I also dabble in the odd fun bouldering competition. My journey has been plagued with ups and downs and I will be discussing these in future blogs as well as relating them to current issues. Every athlete, whether recreational or professional, is affected by issues that impact or test our mental abilities and as I continue with my climbing journey and talk with others around me, I will document them and analyse them from a psychological perspective. I hope to blog a first person's account of dealing with certain issues (solutions may not apply to you) which I hope will be beneficial for demonstration purposes.